Okay, so maybe these girlfriends aren’t going to provide a deep, lasting connection, but when it comes to bragging to your friends, quantity can often beat out quality. If you are one of those men who are tired of your buddies constantly pestering you about your social life- or lack thereof- there is a great opportunity out there for you to gain their respect and possibly even their worship! How exactly can you achieve such great results? Facebook currently has over 800 million users, and this number is constantly growing. Because of this huge community of people, there are great business opportunities on the social networking site. Many companies try to make a profit by advertising or creating Facebook pages with their information on it, but a new trend popping up is individual people trying to make a quick buck on the web. As with many other things in life, this is easier if you are a pretty girl. Many women on Facebook are trying to sell their services as temporary ‘Facebook girlfriends.’ Buying a Facebook girlfriend is relatively cheap at around $5 per week (certainly cheaper than keeping up with a real girlfriend) and they will provide you with a range of services. During the week you hire a Facebook girlfriend, she will post comments on your pictures and wall, talking about how romantic and handsome you are, as well as posting some cute links or images. The services offered by Facebook girlfriends vary, so make sure you talk it over before you hire anyone. For example, some girls are willing to update their status to ‘in a relationship’ for the week you hire them, while others do not offer this provision. While hiring an attracting Facebook girlfriend is a great way to make your friends jealous, there are additional benefits associated with this service. For example, if you have an ex-girlfriend and you two ended off on bad terms, you can show her how quickly you got over her, and how attractive women are paying a lot of attention to you! Moreover, if your new Facebook girlfriend posts comments about how sweet you are, you can make your ex seriously regret breaking up with you. Just being in a relationship is often enough to spark the jealous feelings your ex might have. After all, you always want what you can’t have! There are many great advantages to having a Facebook girlfriend. They can give you an amazing social status among your friends and colleagues without any of the hassle or hard work of finding a date. Nevertheless, it is important to keep a few details in mind. First of all, remember that you only hire a Facebook girlfriend for about a week. If you would like to retain the services longer, you can rack up quite the tab. In addition, you always have to remember that you are working with a woman who has her own life, and thus there is a chance that one day she will stop being a girlfriend for hire. For example, if the girl gets a real boyfriend of her own and wants to say they are in a relationship, you might look like you were just dumped, which doesn’t help with your reputation. However, if that does happen you can simply hire another girl. One of the biggest problems that can come up with Facebook girlfriends is that one of your friends may find out your girlfriend is fake and reveal your secret. An even more awkward situation is if your friend hires a woman you were once ‘dating,’ making it look like he is the better man. Despite these setbacks, Facebook girlfriends are growing in popularity and there are some websites who are making a business out of it. 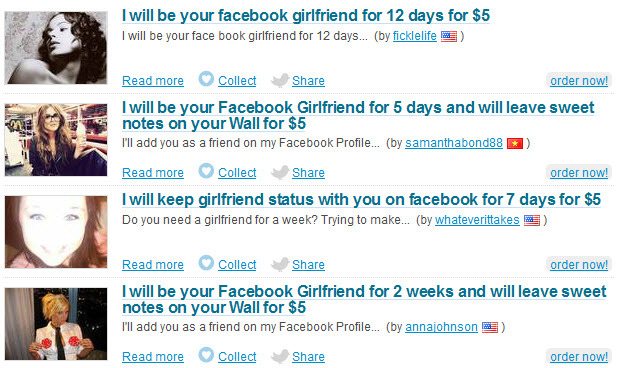 You can find sites which offer a great selection of Facebook girlfriends, all at around $5. Moreover, there are new Facebook services constantly being invented by people. For instance, many people are offering to be third parties in breaking up a relationship if you feel uncomfortable doing so yourself. It will cost you some money to do this, but you will have your feelings worded in an elegant manner and delivered without any shame or awkwardness. Hiring a Facebook girlfriend is a great way to temporarily boost your reputation or make someone jealous, but it is not sustainable if you want a long term girlfriend. Still, it is a great way to raise your stat in social circles, and it even has the potential to earn you a real girlfriend! Rahul Makhija has been in the internet marketing industry for more than 6 years. For more information you can visit Harbor web design. He is an expert on SEO & PPC tactics and in his free times likes to read and understand about human behavior. Great Post ! Quite out of track. I was just going through your site and your article title just attracted my attention.Nicely described.